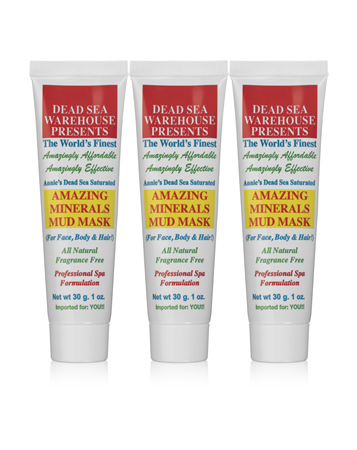 Take a look at our other Dead Sea Products, too! Customer Testimonial: Hi Annie! Your dead sea (magic mineral mud) mask is so wonderful! I have acne on my face (I'm mid-30's) and try everything I can find in the store, from Clinique, Estee Lauder to other small brands claiming anti-acne effect but nothing changed. Until I find your product that's amazing! My acne has been controlled and now I want to express my gratefulness to you. Thank you for providing such a wonerful product! J.Z. in D.C.
...Feel Better, Look Better, Be Better, Naturally! Super Fast Acting - 3-7 Minutes Only!! It's Ok!! Go Play In the Mud!!! Annie's all natural Dead Sea Warehouse Mud Mask is one of Mother Earth's most Super Fast Acting (only 3-7 minute application required) stimulating, mineral rich masks in the marketplace today. Exclusive to Dead Sea Warehouse, this simple but rich and luscious Dead Sea mineral-saturated mud mask is of the absolute highest salon quality at the absolute lowest possible pricing. Never tested on animals. Vegan. Ingredients (INCI): Silt (Dead Sea Black Mud), Glycerin, Gum Arabic, Simmondsia Chinensis (Jojoba) Seed Oil, Dead Sea Mineral Water, Caprylic/Capric Triglyceride, Water (Aqua), Aloe Barbadensis Leaf Juice Powder, Lonicera Caprifolium (Honeysuckle) Extract, Squalane, Lonicera Japonica (Japanese Honeysuckle) Flower Extract, Tocopherol (mixed), Beta-Sitosterol, Squalene. Don't delay! Order Today! Now only $10.77!